Credit card, debit card, and prepaid card payments are expected to grow in the coming years according to recent projections by the Nilson Report. We go over what is fueling this growth and what it means for the industry. The November edition of the Nilson Report released the company’s five-year projections for the credit card industry. The figures predict a massive growth in both the number of transactions and overall card purchase volume. This data is in-line with recent growth experienced by the nation’s largest credit card issuers, including JPMorgan Chase (NYSE:JPM) and Citigroup Group (NYSE:C). Both companies reported strong new account originations in Q3 2016. David Robertson, a publisher for the Nilson Report, commented saying “credit, debit, and prepaid cards spending continues to grow faster than personal consumption expenditures in the U.S. “ – a fact Robertson attributes to the growing incentive programs. Credit cards in circulation rose 6.1% between 2014 and 2015. 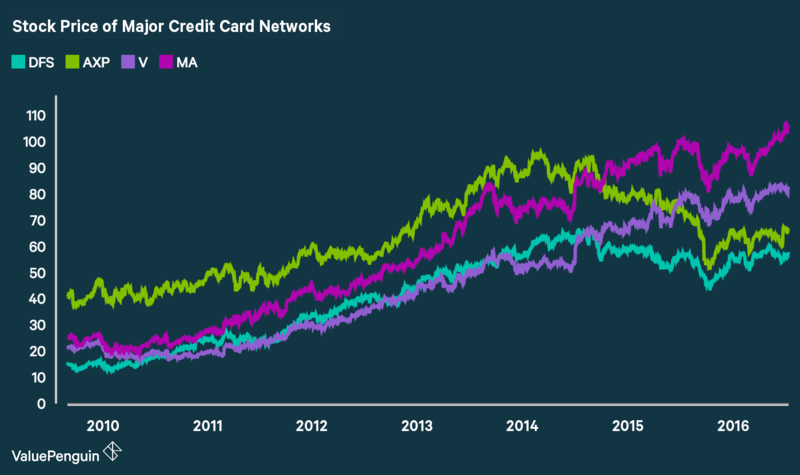 Despite having a rough year, American Express overtook Mastercard’s market share in credit card purchase volume. With 12.36% of all credit card transactions passing through Amex, the company was bested only by Visa (23.15%), who continues to be dominant on both the credit and debit card front. Amex took a rough hit in both its U.S. and Canadian markets. This past year, Amex lost its longstanding partnership with Costco to Citibank and Visa. This portfolio accounted for 8% of their total billed business. Amex also lost Costco in Canada, back in 2015. Given the recent developments, The Nilson Report projected one of the slowest growth rates for American Express – anticipating marketshare to go up by 12.5% over the next 4 years. At the same time, Discover, who in recent years has been relatively conservative about growing their cardmember portfolio, has been projected to grow their outstandings by 32.4% by the year 2020. This is a similar rate of growth as Mastercard – a competitor with a much larger share of the market. Visa, the biggest player in the payments space, recently reported a strong Q4. Their U.S. credit payments volume was up 11% from the last quarter, primarily due to the aforementioned deal Costco. Internationally, the company has also experienced positive impact from its acquisition of Visa Europe Ltd., earlier this year. Vasant Prabhu, CFO of Visa Inc., told investors that 2017 “will be a decent year of growth in Europe, though not as high as we are seeing in other parts of the world or in the U.S.” Though growth continued to be subdued for Visa, the new acquisitions and contract renewals in Asian markets are beginning to improve the situation. These are what puts them on pace to potentially meet the Nilson Report’s projections. According to the Nilson Report, approximately 192 million people will own credit cards in 2020, over half of which will be on the Visa network. Credit cards are also expected to grow at a significantly faster rate than other card payments. By 2020, debit card purchase volume is projected to increase by 32.6% -- a far cry from the 50.9% credit growth. One reason for this gap is the incentive programs that surround these payments -- especially in the United States. Debit cards charge significantly lower interchange fees from merchants, thus turning a lower profit for both issuers and networks when compared to credit cards. The latter produce significant revenue per swipe, which in turn allows banks to fund lucrative reward programs and bonuses. As a result, issuers in the U.S. also put a lot of money into marketing their credit card products. Given the current state of interchange regulation in the United States, this trend is likely to continue through the next five years.